Samsung's ebook efforts took a turn for the confusing today. The electronics giant announced a deal this morning with Amazon that makes a co-branded Kindle app available in the Samsung App Store in 90 countries. Amazon has developed a custom Kindle app, Kindle for Samsung, which debuts this month (today, actually). It's available for the Galaxy S5 and any other Samsung smartphone or tablet running Android 4.0 and above (but not the Galaxy Gear, alas). The app, which you can see in the screenshots below, will offer access to all the usual content in the Kindle Store as well as a few special deals that Amazon and Samsung cooked up. 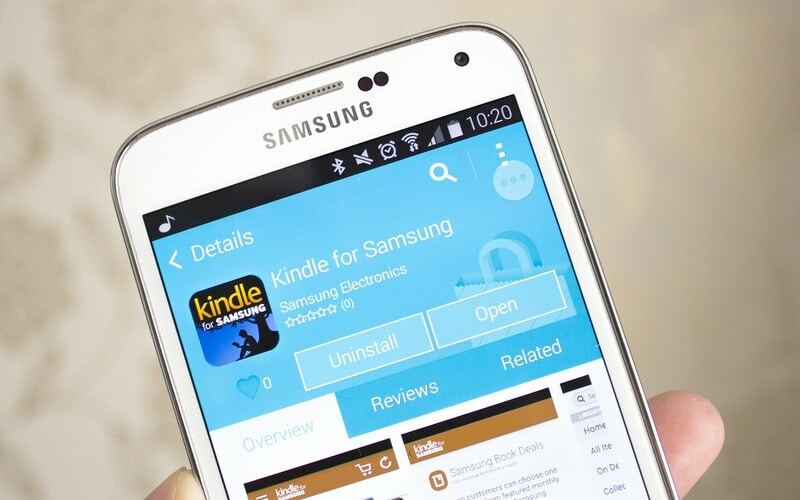 Amazon is going to be working with Samsung to offer monthly free ebook deals exclusively for Samsung device owners. 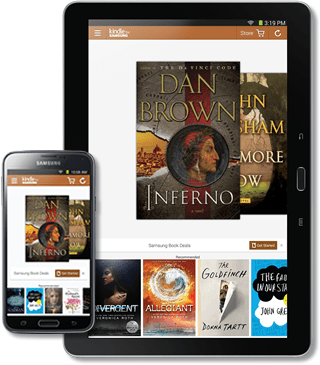 The program is called Samsung Book Deals, and it will provide a free eBook to the reader every month from a choice of 4 titles. This sounds a lot like the Kindle First program that Amazon offers to Amazon Prime members, but without trying the Samsung promotion there's no way to know for sure. Given Samsung's past ebook efforts, today's news is rather puzzling. Samsung has been investing in ebooks since at least 2010, even going so far as to rent a huge booth at BEA 2013. They've sunk money into developing a new version of the Readers Hub reading app which supported Epub3, and thanks to the vast number of Android devices they sell I have been saying that they could be the next iBooks. But now Samsung is partnering with Amazon. That is a baffling about face; it's almost as if Samsung is repeating the deal they signed with Kobo in early 2011. Perhaps Samsung's efforts aren't showing enough success? While Samsung does have their own app and ebookstore, it's not widely available. In fact, I don't think Readers Hub can be downloaded in the US, which is still one of the key ebook markets. The terms of this deal have not been disclosed, so there's no way to tell whether Samsung is being paid anything by Amazon, but I would not be surprised if it turned out that Samsung was getting a commission on ebooks sold via the co-branded app. The Samsung press release mentions Kindle has 500,000 exclusive titles. Did the Samsung reading app ever get even that many? Also of note: they’re releasing Kindle for Samsung in 90 countries, what about the rest? The deal seems to have been cooked in Europe since the quoted execs are from the euro-subsidiaries. I’d say this is a big-ish announcement since it turns a big platform player (and potential rival/front for a rival) into an ally, at least in those 90 countries. Those are likely in the Kindle Owner’s lending Library.